Euro Tour. Week 9. Italy. Zane Schweitzer continues his unbeaten streak in Europe, taking out the $10,000 Adriatic Crown in Italy. Zane beat his Starboard team mate and home favourite Leonard Nika to claim his 4th straight trophy on this year’s Euro Tour, having also saluted in Bilbao (Spain), Oleron (France) and Finland. Other top performers in the 13km Distance Race and 7km Beach Race included the Euro Tour regulars Roman Frejo (Spain), Branislav Sramek (Czech Republic), Marconi Paolo (Italy), Peter Bartl (Austria) and Davide Codotto (Italy). On the women’s side it was Susak Molinero and Silvia Mecucci going 1-2 in both events. But the winner was clearly Zane Schweitzer, who is officially in red hot form right now. The Maui boy’s biggest test will, however, come this weekend in Germany, when Kai Lenny, Connor Baxter and Jake Jensen fly in for the SUP World Cup in Fehmarn. Can’t wait to see those results. Post by Adriatic Crown SupRace. The Euro Tour was supposed to only run from mid May to the end of June. But nobody told Europe. 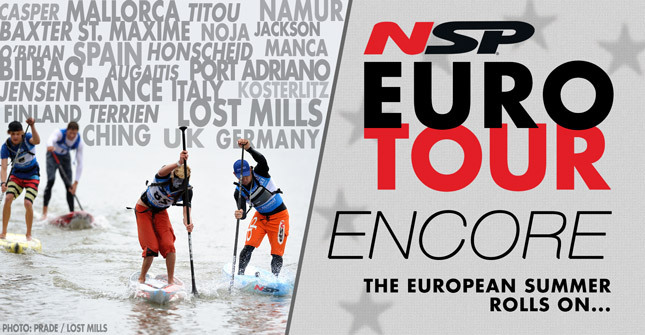 There are still big races happening every weekend right throughout July, so we’ve nicknamed it Euro Tour: Encore.